Jeremy Saulnier burst into the limelight with his terrific revenge thriller ‘Blue Ruin’ a couple of years ago, and I’m pleased to say his follow up is every bit as terrific as his debut. ‘Green Room’ is a gripping, taut thriller that grips from the outset, ramping up the suspense from the moment ‘The Ain’t Rights’ arrive at a dodgy woodland bar to play a set. Like ‘Blue Ruin’, Saulnier has crafted a tight narrative that wastes little time in getting to the action, providing us with just enough information to invest in his characters. The premise is fairly simple: a punk band struggling to make enough money to get back home from touring take on a gig at a neo-Nazi bar off the beaten track to help make ends meet. Apart from an ill advised choice of opening song, their set seems to go down reasonably well and they’re ready to leave, cash in hand, when they stumble upon a dead body. 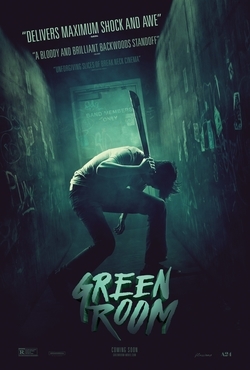 From this point onwards, ‘Green Room’ becomes a frightening horror movie as the band are locked in the so called Green Room battling for their lives. Let it be said that ‘Green Room’ is not for the faint hearted. This is one of the most violent and gory films I’ve seen in some time, and it’s genuinely scary on several occasions. It’s not scary in a ‘this is a horror movie and you’re going to jump’ kind of way either, but in a much more existential way. The set up feels so grounded and Saulnier’s script constantly goes to places we don’t expect, keeping us (and the characters) on constant edge. This is helped by the excellent direction and use of various props as weapons or as tools to try and create an escape route. ‘Green Room’s’ cast is headed up by Anton Yelchin and Imogen Poots, who are both terrific (Yelchin in particular), but the man getting all the plaudits is Patrick Stewart who plays the vicious white supremacist who owns the bar. Stewart’s Darcy is a calm, softly spoken man whose villainy is kept beneath the surface, and he’s all the more compelling for it. Stewart is an actor with a tremendous amount of gravitas and it’s great to see him play against type. Saulnier also finds a part for his ‘Blue Ruin’ star Macon Blair, as one of Darcy’s men, and he creates an empathetic portrayal of a man we should have little time for. ‘Green Room’ is an unsettling and genuinely arresting thriller from Jeremy Saulnier that reinforces his talents as a director. Superbly crafted with a great script, ‘Green Room’ uses violence and horror to terrific effect to create a memorable genre thriller and I highly recommend it.